Code compliant fasteners and structural fixing systems require a high degree of reliability, and any compromise on quality cannot be accepted. Every detail of an Erico CADDY fastener component, from initial conception through design and manufacture, is aimed towards providing cost effective solutions. A hammer, pliers and screwdriver can be the only requirements. For certain applications manual installation is possible. CADDY Fasteners, manufactured by ERICO, are produced from spring steel, galvanized steel, plastic, as well as other materials. Erico is know in the industry as a leader in the design and production of spring steel fasteners. Static load limit is a rated stationary load limit for a fastener. ERICO standards require that test samples withstand a load equal to 3x this rating. The ultimate static load limit is a rated stationary load limit which, if exceeded, may cause failure of the fastener. ERICO standards require that test samples withstand this rating. Some CADDY fasteners also are designed with an undefined rating and are to be used for positioning only with no loading on them. Static load limit and ultimate static load limit values specify maximum allowable installed loads for user applications. These values are for loads applied VERTICALLY to the normal fastener installation except as may be diagrammed otherwise. Where the load rating of the CADDY fastener exceeds that of the structural member, the lowest rated item must set the load limit. 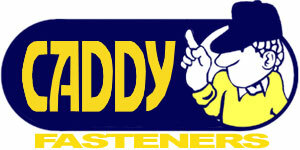 NOTE: CADDY fasteners are intended for support of electrical components at stationary loads. Not to be used for dynamic loads such as fluid and gas distribution components, etc. CADDY fasteners used with wire, rod or threaded rod are designed for use with coarse round wire, hot rolled carbon steel bar, cold rolled carbon steel bar and threaded rod all meeting AISI specifications for tolerances. Only CADDY provides the industry with the widest application range 1/4" to 1-1/4"
2H4 3/32" - 9/64" 100 160 lbs. 4H24 1/8" - 1/4" 100 200 lbs. 4H58 5/16" - 1/2" 100 200 lbs. 4H912 9/16" - 3/4" 100 200 lbs. Easy installation to beam flangs up to 1/2"
Easy installation for beam flanges 1/8" to 5/8"
Available riveted to conduit clips 1/2" through 2"
Attaches to beam flange up to 3/4"
One fastener fits flanges 1/16" to 1/4"